We Have A Winner! | We Have A Winner! Madonna Renewal Center.- Freeport Il.- On Saturday, October 17, the Sisters of the Immaculate Heart of Mary held the raffle for the 1957 Chevy. Amid much anticipation the winner was picked from the 500 tickets in the hopper. The winning number was # 0257 held by Mr. Bob Gosdick of Rockford, Il. who won the car. The number was picked by Freeport, Il Chief of Police, Mr. Todd Barkalow. 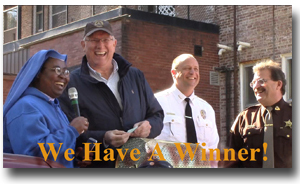 The second prize of $750.00 was won by ticket # 0166 purchased by Mr. Joseph Giannotti of Neward, DE. This ticket was drawn by Mr. David Snyders, Stephenson County Sheriff. The third prize of $ 500.00 was won by Mr. James D. Chesser of Montgomery, Il and drawn by Illinois State Representative Brian Stewart. The third prize winner generously donated the prize back to the Sisters for their renovation program. The 1957 Chevy was donated to the Madonna Renewal Center restoration fund anonymously by a most generous donor. The raffle has added $50,000.00 to the cause of the Madonna Renewal Center. We thank everyone who participated in this raffle in any way; those who purchased tickets, all the hard working members of the MRC fundraising committee, and all those who did anything to help this event take place.